When I was in Germany, just before Christmas, I bought myself a desk calendar which gave you a new painting every day. I was fascinated by today’s picture of a young girl reading entitled Lesendes Mädchen (Girl Reading) by Federico Zandomeneghi. I had never heard of the artist and thought it would be interesting to look at his life and his some of his beautiful works of art. He would become known for his many pastel portraits of ladies and children. Federico Zandomeneghi was born in Venice in June 1841. He came from a family line of sculptors. Pietro, his father, was a neoclassical sculptor as was his grandfather Luigi but unlike his father and grandfather Federico, and much to their annoyance, he favoured painting to sculpture. In 1856, at the age of fifteen, he enrolled on a painting course at the Academia di Belle Arti in Venice and then later studied at the Accademia di Belle Arti di Brera in Milan, where he studied under the neoclassical-style painter Giralamo Michelangelo Grigoletti and Pompeo Marino Molmenti. Venice was under Austrian rule when Napoleon was defeated in 1814 and it became part of the Austrian held Kingdom of Lombardy-Venetia. Venice was firmly under the control of Austria and as such the Venetian citizens were conscripted into the army. To escape conscription, Federico fled his city in 1859 and went to Pavia, where he enrolled at the university. In 1860, when he was nineteen years of age, he joined the military forces of Guiseppe Garibaldi as one of the volunteers in The Expedition of the Thousand, part of the Risorgimento, the push for Italian unification. As a Venetian this was looked upon as a kind of treachery. His flight from Venice in 162 to Florence to avoid conscription resulted him being charged, in absentia, with desertion. As a young aspiring artist Federico wanted to mix with other artists in the Tuscan city and by doing so assimilate their views of art. One of the favoured meeting places for the artists was the Caffè Michelangelo . It was here that the Macchiaioli met. The Macchiaioli, which literally means patch- or spot-makers, was a group of rebellious Italian artists based in Tuscany during the second half of the 19th century and was formed more than ten years before the French Impressionists came onto the scene. They rebelled against academic artistic training and many art historians believe they brought about a breath of fresh air into Italian painting. They ignored the type of painting which was popular at the time such as Neoclassicism and Romanticism. They were looked upon as the founders of modern Italian painting. The Macchiaioli believed that areas of light and shadow, or macchie were the most important parts of a painting and when Italian artists spoke of macchia they were talking about the sparkling quality of a drawing or painting. The Poor on the Steps of Ara Coeli in Rome by Zandomeneghi is now housed at the Pinaconteca Brera in Milan. It is a fine example of verismo the nineteenth century Italian painting style and was a style frequently used by the Macchiaioli. It is a style of painting we would term as realism. It features a group of poor people, men, women and children sitting on the steps of Santa Maria in Aracoeli (St. Mary of the Altar of Heaven), one the oldest basilicas in Rome. 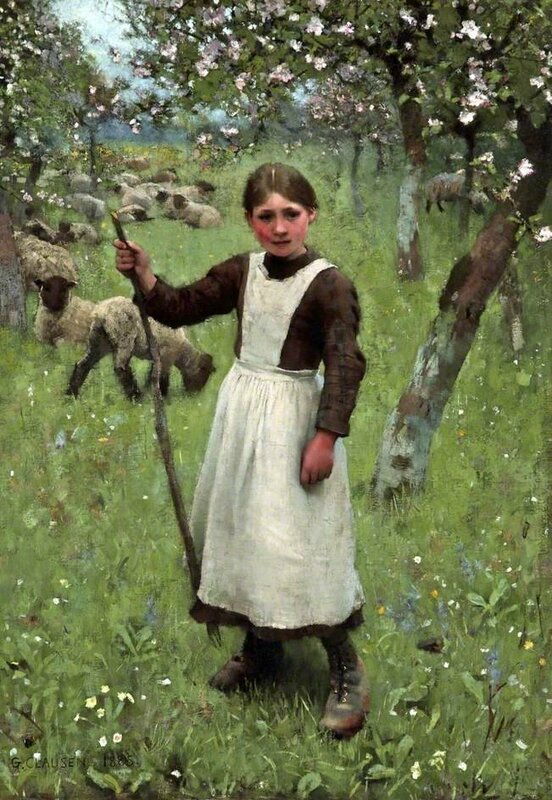 There was a strong connection with French art as many of the Macchiaioli were influenced by the French artists such as Courbet and Corot who belonged to the Barbizon School as well as other nineteenth century plein air painters whose works the Macchiaioli artists were able to see when they visited the French capital. En plein air painting was at that time a ground breaking method of painting but its proponents believed that it allowed for a new vibrancy and naturalness in the reproduction of light which would have been lost if the painting had been carried out in a studio. Some of the members of the Macchiaioli, like Federico, had fought alongside Garibaldi in his effort to attain Italian unification. Many of the works of the Macchiaioli featured grand battles scenes of the Risorgimento as well as landscapes and genre paintings featuring both the bourgeoisie and peasants. Another painting completed by Zandomeneghi whilst he was living in Florence is one of my favourites. It is entitled Palazzo Pretorio and was completed in 1865. It can now be found in the Museo d’Arte Moderna, Ca’ Pesaro, Venice. The work of art was exhibited that year in the rooms of the Società Veneta Promotrice (Venetian Promoter of Fine Arts) which was based in Palazzo Mocenigo at San Benedetto. The depiction of light and shade we see in the painting was strongly influenced by the Macchiaioli artists of Florence. Whilst in Florence and through his association with the Macchiaioli artists, Federico Zandomeneghi met the Italian art critic Diego Martelli. Martelli was a great supporter of the painters of the Macchiaioli and would often invite them up to his large Tuscan estate in Castiglioncello which was an ideal setting for their en plein air painting sessions. Martelli wrote fervently about realism in art and favoured the works of Gustave Courbet as well as the plein air artists of the Barbizon School. He made a number of trips to Paris and its thought that he persuaded Zandomeneghi to leave Florence and go to live in the French capital. 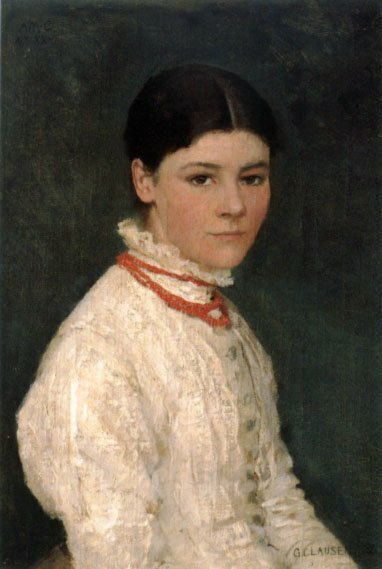 Through their correspondence Zandomeneghi introduced Martelli to the works of the Impressionists so much so that it is said that Martelli was one of the first and leading supporters of Impressionism in Italy. Like Zandomeneghi, Martelli became good friends with Degas who painted his portrait in 1879. The Degas portrait is unusual in as much as the sitter is viewed from above which is somewhat unflattering as it accentuates the corpulence of Martelli. We see Martelli sitting unsteadily on a small stool. To his left is a table, scattered on which are numerous objects belonging to the sitter. The addition of these items was a trademark of Degas’ portraits as he felt it told viewers more about the subject of the portrait. The painting is now housed in the Scottish National Gallery. In 1874, Federico, now thirty-three years of age, moved to the art capital of Europe, Paris, and little did he know then, he would never return to his Italian homeland. On his arrival in Paris, as was the case when he arrived in Florence, he wanted to immerse himself into the life of an artist and mix with the artists of Montmartre. To be an artist in the French capital at this time was a chance to witness the birth of what would later be termed by the art critic, Louis Leroy, as Impressionism. The year 1874 was the year of the Impressionist’s first annual exhibition in Paris. Federico would often frequent the Café de la Nouvelle-Athènes on Place Pigalle. It was here that he first met and befriended Edgar Degas, who was seven years his senior. It is said that we are often drawn to people who have the same characteristics and the same looks upon life and as such Degas and Federico Zandomeneghi were well matched. Both were recalcitrant and often boorish and this similarity of behaviour ensured they would remain life-long friends! 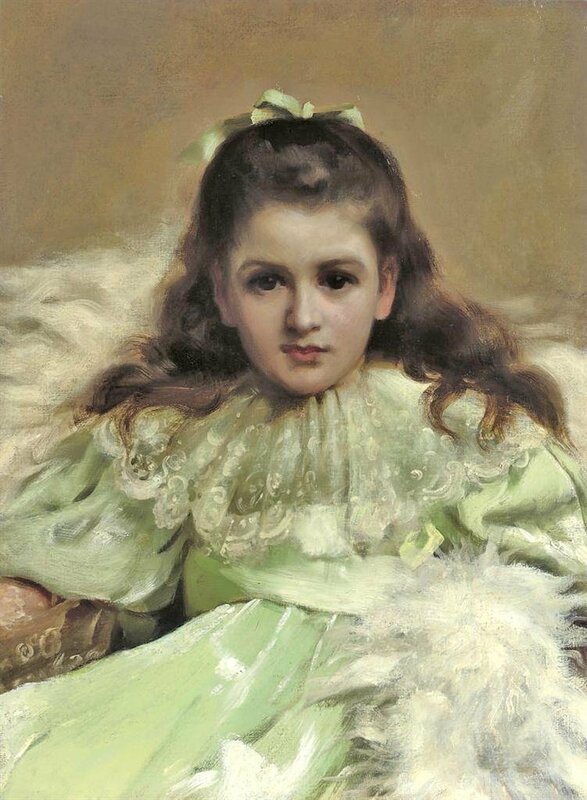 Although great friends with Degas, Federico was more influenced by the works of Renoir and Mary Cassatt and the way they portrayed women in their art work. This was to lead to many of his works featuring females going about with their daily chores or being immersed in reading. Zandomeneghi liked to portray through his artwork, and like that of the Impressionists, the elegant high society of the French capital but his paintings were not imitations of the Impressionists’ works. He had his own inimitable style. The Impressionists had by 1879 held three annual exhibitions and Degas persuaded Federico to exhibit some of his work at the fourth annual exhibition at the Avenue de l’Opéra, during the months of April and May in 1879. Besides Federico there were three other “first appearances” exhibiting at the Fourth Impressionist Exhibition, the husband and wife Impressionists Félix and Marie Braquemond and Paul Gaugin. Federico went on to exhibit at the fifth (1880), sixth (1881) and the eighth and final exhibition in 1886. To sell one’s work one has to have a good dealer and through the good auspices of his Impressionist friends Federico was taken on by the gallery owner and art dealer, Paul Durand-Ruel who acted as his sole agent. It was this Parisian art dealer who changed the fortunes of Federico when he exhibited the Italian artist’s work in America. 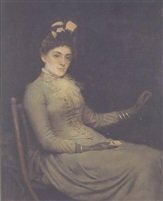 In the 1890’s, having had to supplement his income from the sale of his paintings by providing illustrations for Paris fashion magazine, once his work was seen in America he was inundated with commissions. It was around this time that Federico changed the medium in which he worked, now favouring in pastels. Federico Zandomeneghi died in Paris on the last day of 1917, aged seventy-six. It was not until 1914, three years before his death, that he was given his first one-man show which was at the Venice Biennale of that year in his native country. There were so many paintings by Zandometeghi I could have showcased but I have just chosen some of my favourites but I hope you will search out more of his works. 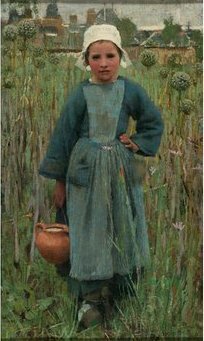 In my last blog I looked at Perov’s early life and his artwork which is often categorised as critical realism because of the way his paintings focused on the peasants and how they had been let down by the Church, its clergy and the State. For one of these works he was awarded the Gold Medal by the St Petersburg Imperial Academy of Arts and also a scholarship for him to travel to Europe and study European art. He went to Paris where he spent a considerable amount of time but once again his art focused on poverty, this time, poverty in France. Perov was now moving away from his anti-clerical depictions, and his barbed narrative works which poured scorn on the Church. He now wanted to concentrate on the poor themselves and left the observer to decide on the reason for the poverty. One of his most famous paintings, which he completed whilst in France, was one entitled Savoyard which he finished in 1863. In Perov’s painting we see a young boy sat slumped on some stone steps. The absence of any movement allows us to focus on the child without any distractions. The child is asleep. His feet stick out in front of him and this allows us to see the tattered hems of his trousers and because of the way is feet rest on the pavement we are given a view of the soles of his shoes, which are holed. The painting itself is made up of dark sombre tones of smoky blue, green and grey. It is thought that Perov’s painting was influenced by the work of Paul Gavarni, a French engraver, who had his illustrations published in a collection of London sketches, featuring life in London at the time. The sketches and accompanying illustrations were first published as a magazine series in 1848 and later they were collected in one volume, edited by essayist and journalist Albert Smith, which was first published in Paris, in 1862, a year before Perov’s arrival in the French capital. It was entitled Londres et les Anglais. One of the sketches was the Street Beggar and its thought that Perov had this in mind when he worked on the Savoyard. Perov’s arrival in Paris in 1863 coincided with a great upheaval in French art. The Hanging jury at that year’s Salon had been ruthless in their choice of paintings which could be admitted. Those which were cast aside were ones deemed to have not been of the quality or type they wanted. That year, the jury had been more ruthless than they had been in the past, rejecting two-thirds of paintings. This resulted in vociferous protests from the artists who had had their works rejected. It was so bad that Napoleon III stepped into the argument and placated the disgruntled artists by offering them a separate exhibition for their rejected works. It became known as the Salon de Refusés (Exhibition of rejects) and that year this exhibition exhibited works by Pissarro, Fantin-Latour, Cezanne and included Manet’s Dejeuner sur l’herbe and Whistler’s Symphony in White,no. 1. Perov returned home early from his European tour in 1865 and in 1866 produced a wonderful painting entitled The Arrival of the Governess at a Merchant’s House. This was a move away from his focus on poverty and more to do with the fate of women. In the painting we see a governess standing before the master of the house, a merchant who is to be her new employer. This painting depicts the awkward encounter between the governess, who has probably graduated from a school for governesses, where they are taught to act like nobility, and the merchant who has no noble blood and is the face of the nouveau riche. She presents herself well. She clutches a letter of introduction in her hands. She oozes an air of timidity and subservience, which is a trait that would be required if she was to become a member of the household. However her demure stance with head bent down is befitting that of a lady. She stands before, not only the master of the house, a bloated man, but behind him stands his family. The children of the family are to be her pupils and by the looks of them she was going to be in for a difficult time. The master of the house and his three children are dressed elegantly and the furnishings we see are fine and elegant and are part of merchant’s plan that they be elevated in status from mere merchants to something approaching nobility. Perov has changed the subject of his biting satire from the clergy of the Church to the oppressive merchant classes and the poor treatment they bestow on their employees. The painting was purchased by thirty-four year old Pavel Tretyakov, a Russian businessman, patron of art, avid art collector, and philanthropist who gave his name to the Tretyakov Gallery in Moscow. This work along with his Troika painting earned Perov the title of Academician. In the late 1860’s Perov began to concentrate on portraiture, initially of peasants and the title Wanderer was given to three of his works which featured peasants, all different and yet all emotive in their own way, one of which is shown above. As Perov travelled around he came across a variety of fascinating characters and he was able present them on canvas and highlight their individualism and their way of life. In the early 1870’s Perov’s portraiture focused on cultural greats of Russia but it is interesting to note in these next two paintings they were totally devoid of any background accoutrements which would have added a sense of vanity in the sitter. In 1872 he completed the Portrait of Dostoyevsky, a the Russian novelist, short story writer, essayist, journalist and philosopher. It was Dostoyevsky’s literary works which influenced Perov in the way they explored human psychology in the troubled political, social, and spiritual atmosphere in Russia during the 19th-century. And in 1871 he finished his Portrait of Alexander Ostrovsky, a Russian playwright who was generally thought to have been the greatest writer of the Russian realistic period, which existed against the background social and political problems. It started in the 1840’s under the rule of Nicholas I and lasted through to the end of the nineteenth century. The painting is now housed in the Tretyakov Gallery, Moscow. In all his genre works he always managed to tug at your heart strings with his moving depictions. Another of his heart-rending scenes was completed in 1874 and was entitled Old Parents Visiting the Grave of their Son. 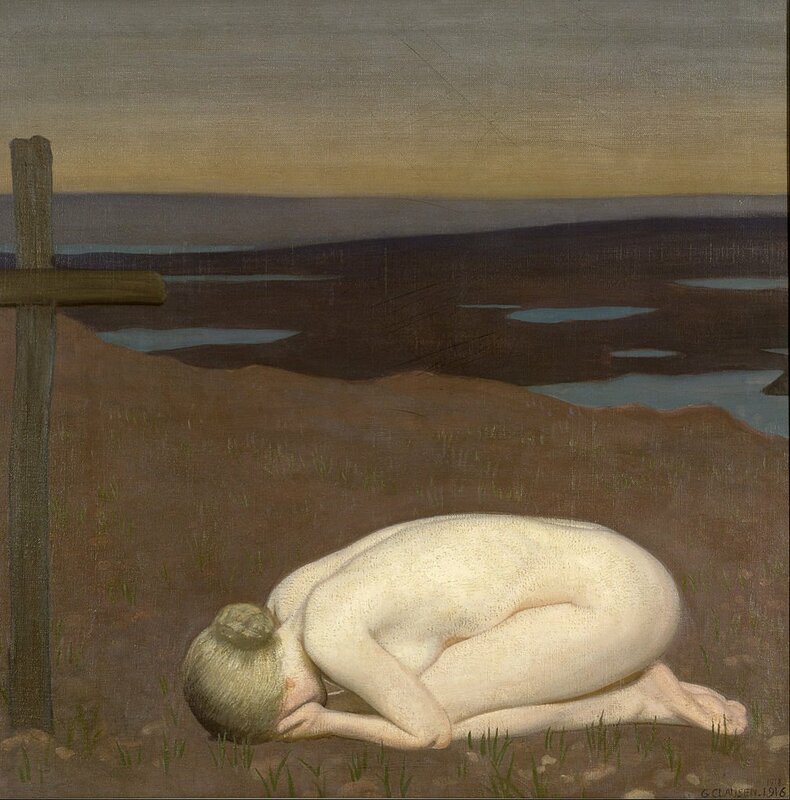 It is said that nobody should suffer the agony of burying their children and in this work we feel the loss of the mother and father as they stand, heads bowed, at the side of the son’s grave. This painting, like many of his other works, are to be found at the Tretyakov Gallery in Moscow. As always I have the dilemma of which paintings to show you and which ones to leave out. I just hope the blog will get you to search the internet for more of his works. My final offering is one that features Perov’s sense of humour. It is in complete contrast to his works which looked at poverty and the impoverished existence of the peasant classes. It is a painting entitled Amateur which he completed in 1862. It is both humorous and fascinating. Before us we see a man slouched in a chair, chewing on the end of his maulstick, eyes narrowed as he looks at his work. His wife stands beside him holding a baby. She too is closely examining the canvas. From the way the man is dressed along with the background details of the room we gather that this is an upper-middle class couple. Another give away to the man’s social status is the way Perov has depicted him. Well dressed, highly polished shoes and overweight. Perov’s depiction of this man is similar to the master of the household, the merchant, whom he depicted in The Arrival of the Governess at a Merchant’s House- overweight, through all the food he had been able to buy and eat, whereas in most cases Perov portrayed the poor peasants as thin undernourished people. Vasily Grigorevich Perov died of tuberculosis in Kuzminki Village which is now part of Moscow and was laid to rest at Donskoe Cemetery. He was fifty-eight years old. 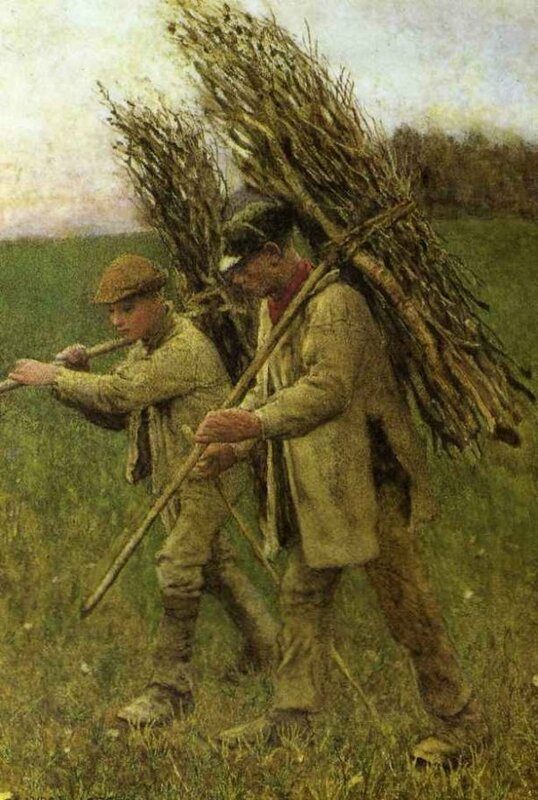 In my next two blogs I am going to look at the lives and works of two English painters, the father, Thomas Benjamin Kennington and his son, Eric. Today I am going to concentrate and examine some of the works of the father and tomorrow, switch to look at the art of his son. Often when we watch a tear-jerker type film or read a heartbreaking fictional novel, we tend to be critical of the sugary-sweet, heart-tugging subject. My featured artist today produced many paintings which, although of the realism genre, also wanted us to be emotionally moved by what we saw before us. 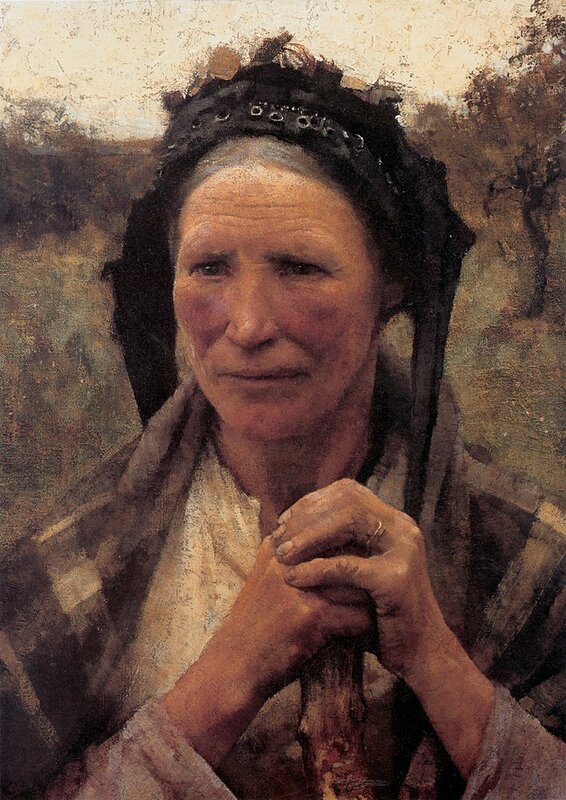 His paintings were often studies of the problems which beset the poor in Victorian England. Today let me introduce you to the Victorian social realism painter and master of portraiture, Thomas Benjamin Kennington. Kennington was born in the Lincolnshire fishing port of Grimsby in April 1856. As a young man he studied painting at the Liverpool School of Art, where he won a gold medal, and the Royal College of Art in London. He also went to Paris where he enrolled at the Académie Julian and studied under William-Adolphe Bougereau and Tony Robert-Fleury. Thomas Kennington lived at a time when there were a large number of families living on the “bread line”; a term used denoting the poorest condition in which it is acceptable to live, with some even dying of starvation on the city streets. The population of Great Britain increased three-fold during the nineteenth century due to many factors, such as an influx of people from Ireland who were escaping the potato famine, life expectancy had increased and infant mortality had decreased. 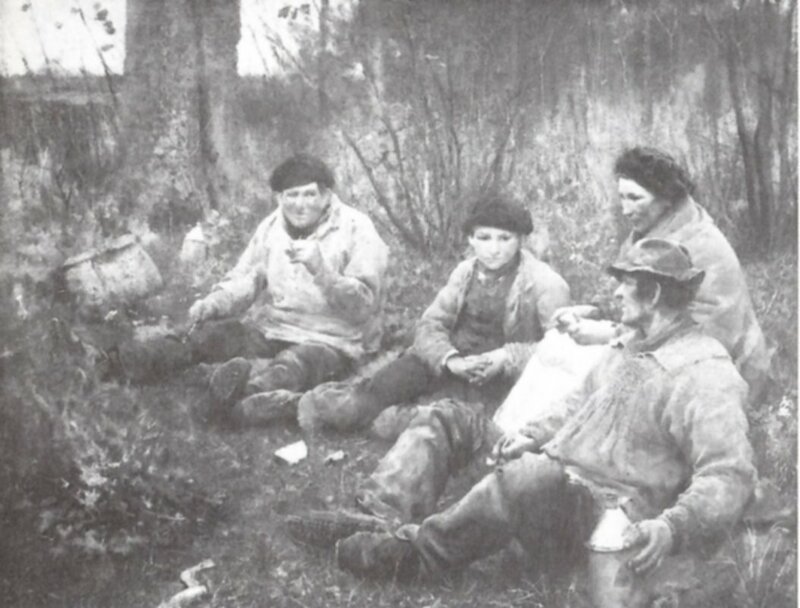 Jobs were hard to find in the countryside so folks had flocked to the urbanized areas seeking work. With such a pool of workers, owners and businessmen could pay low wages, often so low that workers could not afford to feed or house their families. In the middle of the nineteenth century it was estimated that there were more than thirty thousand homeless children living on the streets of London. However, many of the well-off folk were less than sympathetic with regards their plight and believed that any money given to the poor was simply squandered on drink and gambling and did not, in any way, solve the underlying social problems at all. 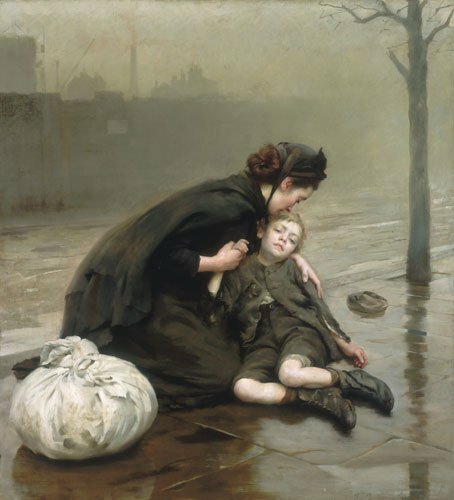 Thomas Kennington was a social activist who was disturbed by the poverty he saw around him and decided that, through his art, he would highlight the plight of the poor. 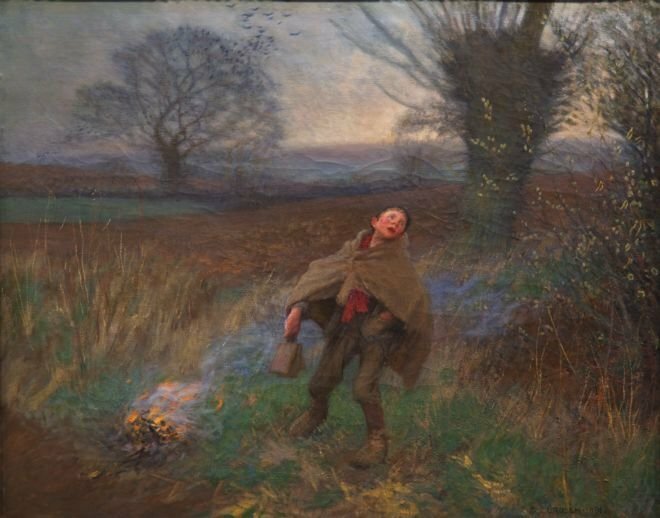 The first painting I am showcasing is entitled Homeless which he completed in 1890, whilst living in London. In 1892 it was sent to Melbourne for the large Anglo-German exhibition which was held in Melbourne’s exhibition centre and the painting is now housed in the Bendigo Art Gallery in Australia. 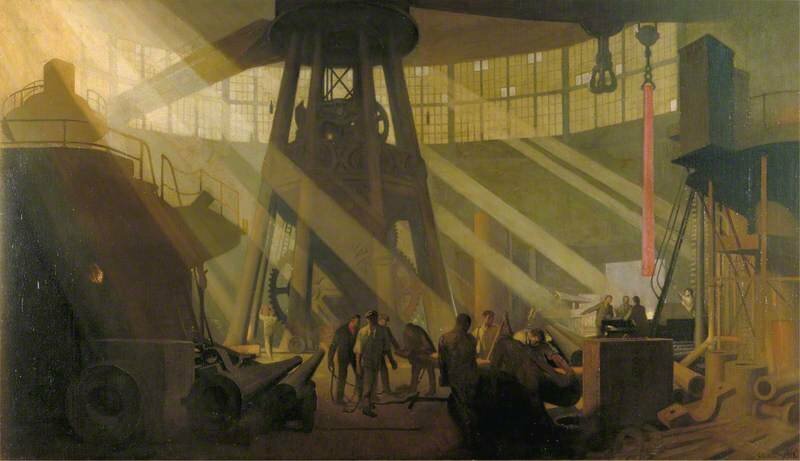 The setting for the work is unknown but presumed to be London. In the background, partly hidden by the smog, we see a gas works and a tall chimney belching out smoke. This is a scene of urban pollution; a gloomy streetscape. In the foreground we see a woman dressed in widow’s garb supporting a young boy’s body, partly lifting him up from the wet pavement. The young lad’s face is white and his head has lolled to the side. He looks to be in a bad way, possibly close to death. His eyes vacantly stare out but he seems unaware of his surroundings. The artist has further depicted the depressing state of affairs by limiting the depiction of nature to a lifeless-looking tree at the right of the painting. It is leaf-less with one of its lower branches broken off and the whole of it is encased in the concrete pavings which will inhibit its growth. 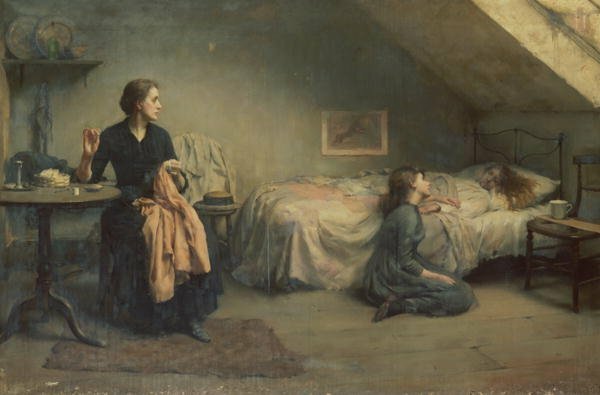 Another work of art which focused on how poverty can affect families was summed up in Kennington’s work entitled Widowed and Fatherless, 1888. In this depiction we have a mother whose husband has died and she is left with the monumental task of rearing her children. One child is lying on the bed. Maybe she is asleep or maybe she is very ill. Her sister kneels at the bedside praying, maybe praying that her sister will recover from her illness. The mother sits in a chair stitching clothes but she cannot take her eyes off her sick daughter. 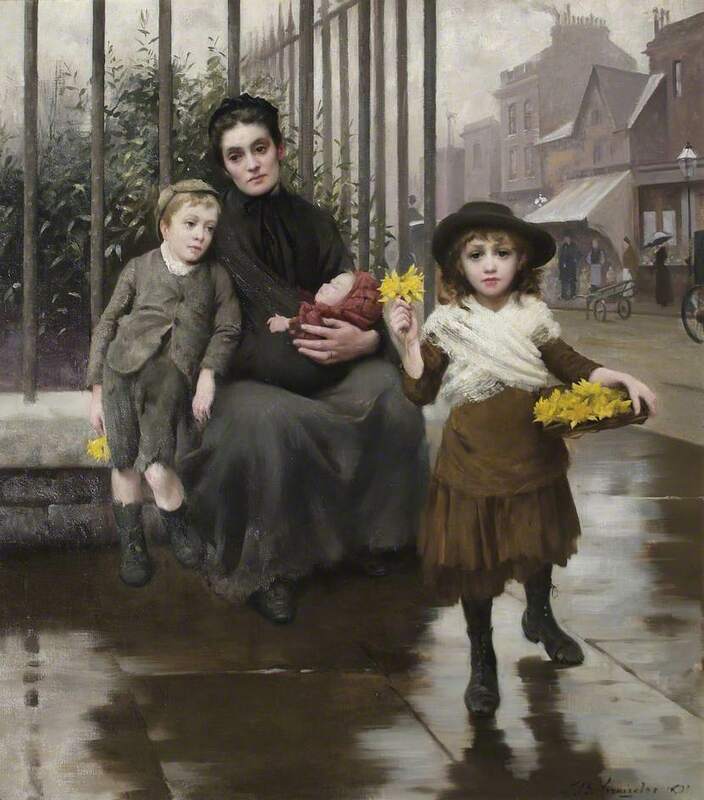 A very moving painting depicting the plight of the poor is one Kennington completed in 1885 entitled Orphans. There is a similarity in this depiction of poverty with the 1650 work by the great Spanish painter, Bartolomé Esteban Murillo in his work The Beggar Boy. (See My Daily Art Display January 25th 2011). Before us we see two young boys. They could be brothers. Their clothes are no more than rags. The older boy’s head is slumped to the side due to his tiredness. He can hardly keep his eyes open but they stare down at the head of the younger boy who through circumstances beyond his control, is whom he has to look after. The younger boy, with his rosy red cheeks, sits on the floor and leans against the older boy for comfort, his head and arm rest on the older boy’s thigh. He stares out at us in a beseeching way. What is he asking us? Is it merely sustenance or does he want our love and our protection from the deprivation he is forced to suffer. On the floor before the two boys is a plate with a piece of dried bread highlighting their plight. This is a prime example of Kennington’s depictions of the urban poor. The painting was purchased by Henry Tate, the sugar merchant and philanthropist, who established the Tate Gallery in London. 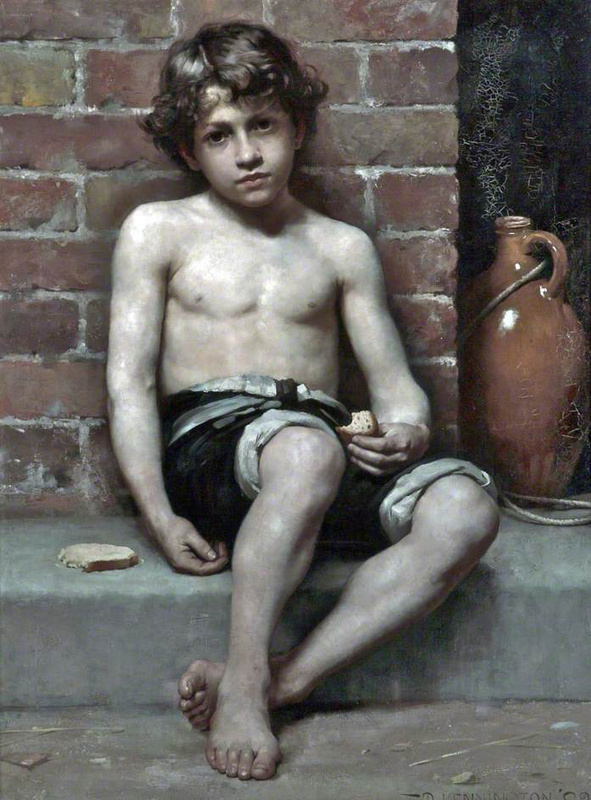 A crust of bread appears in another painting by Kennington, entitled Daily Bread which he completed in 1883. The title probably derives from the words of the Lord’s Prayer, give us our daily bread. 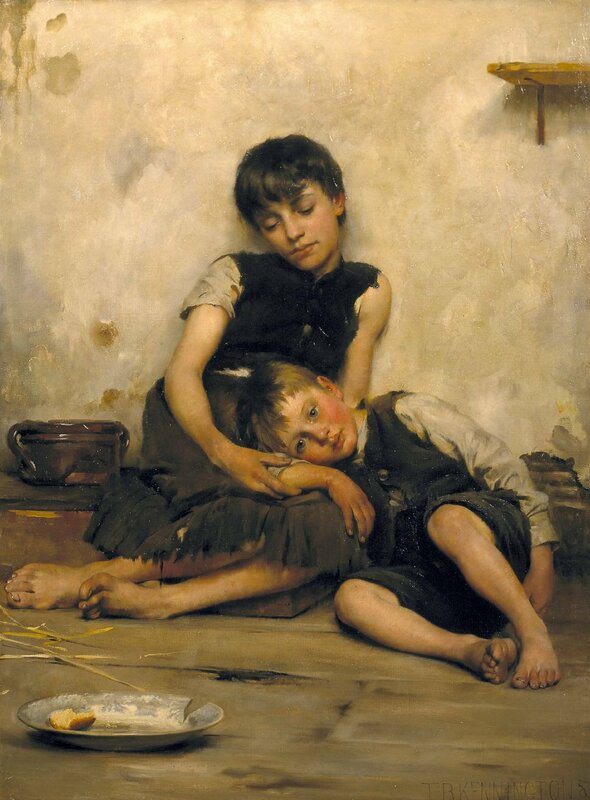 This is a very emotional depiction of poverty and it was hoped that by depicting such dprivation things would change. Alas, it was not to happen for many years and even now child poverty and child beggars exist in Great Britain. In contrast to the abandoned children we saw depicted in the previous paintings, the next painting, simply entitled The Mother, was Kennington’s idea of what family life should be about and how children should be brought up in a safe and loving environment. 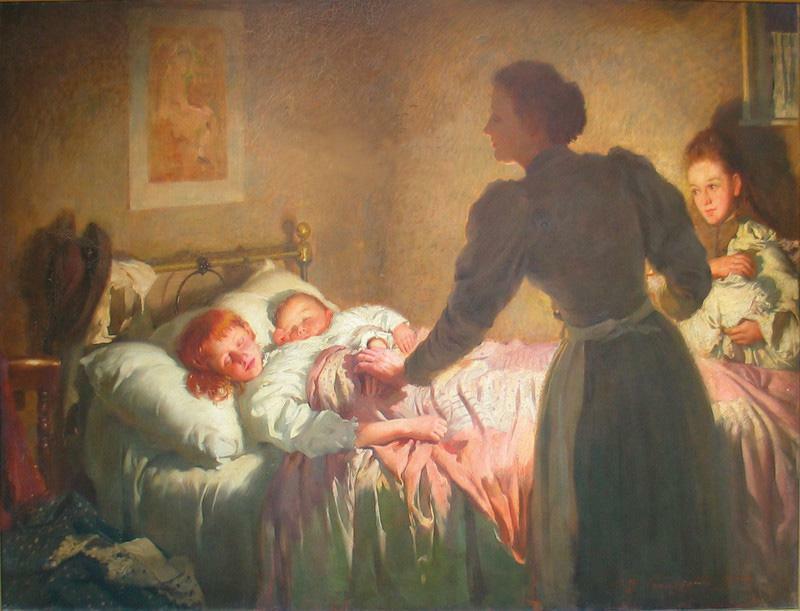 This large work (115 x 168cms), which was completed in 1895, depicts a moment in family life when a mother says goodnight to her children. This is a form of narrative painting as from about the seventeenth century, genre painting showed scenes and narratives of everyday life. Later, during the Victorian age, narrative painting of everyday life subjects became very popular and such art was often considered as a category in itself termed Victorian Narrative painting. This theme of what family life should be about was a recurrent theme in Victorian art. Domesticity was the order of the day focusing on how children and adults should behave within a family environment. It was hoped that families could learn by what they saw through the medium of visual art. This huge painting of The Mother by Kennington depicts her as the foundation stone of the family, the person who underpins the family group. The painting also alludes to another idea regarding Victorian family group. If you look carefully at the dead centre of the work you will see the wedding ring on the mother’s finger and this could be the way in which the artist want to share his belief that marriage was also very important part of the family structure and family values. Thomas Kennington exhibited his works in the Royal Academy of Arts every year from 1880 until his death in 1916. 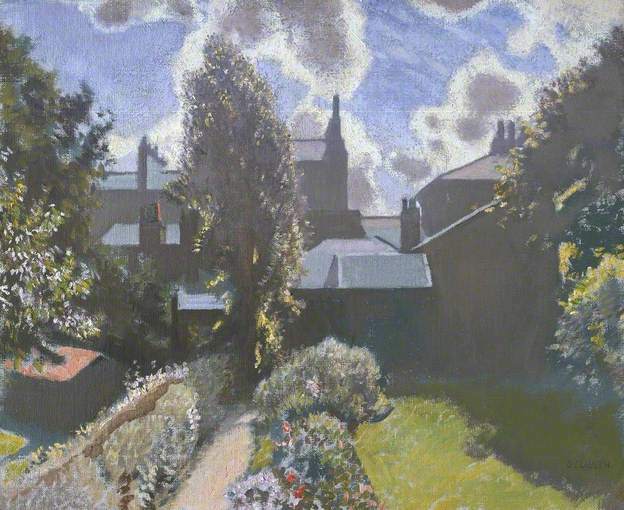 His paintings were also regularly on show at the Royal Society of British Artists (RBA) and the popular Grosvenor gallery in London. 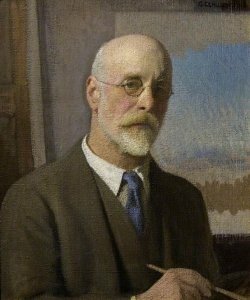 Kennington was a founding member and became the first secretary of the New English Art Club which was founded in 1885 and was one of the founders of the Imperial League of Art in 1909. This society was set up to protect and promote the interests of Artists and to inform, advise and assist Artists, who have enrolled as members, in matters of business connected with the practice of the Arts Its role was to aid the artists and the protection of their interests. Kennington exhibited internationally in Paris and Rome and so good was his work that he was chosen to exhibit at the Universal Expositions held in Paris in 1889, where he was awarded a bronze medal. 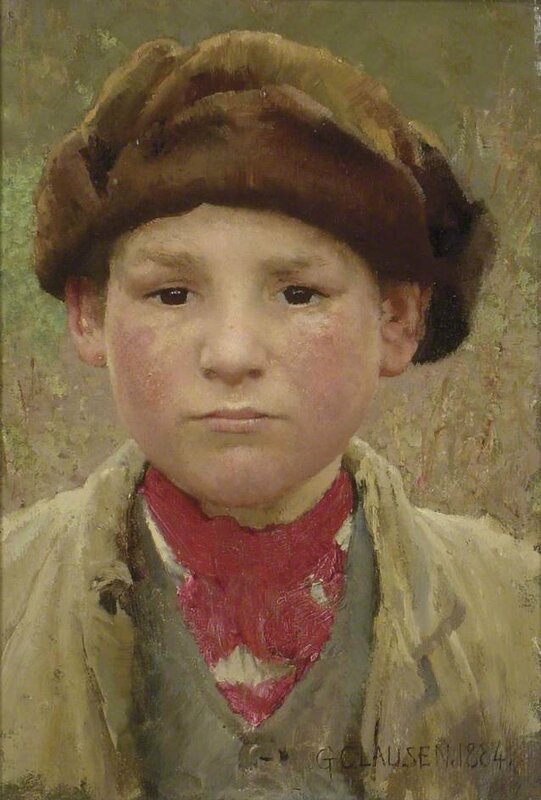 Besides his genre pieces which highlighted Victorian poverty, Kennington was an accomplished portraitist. Many of his portraits featured family members. In 1883, aged twenty-seven, Thomas Benjamin Kennington married twenty-two year old Swedish beauty, Elise Stevani, who was born in Lund a town in Southern Sweden 1881. His daughter Ann also featured in a couple of his works. One was with her as Alice in Wonderland. 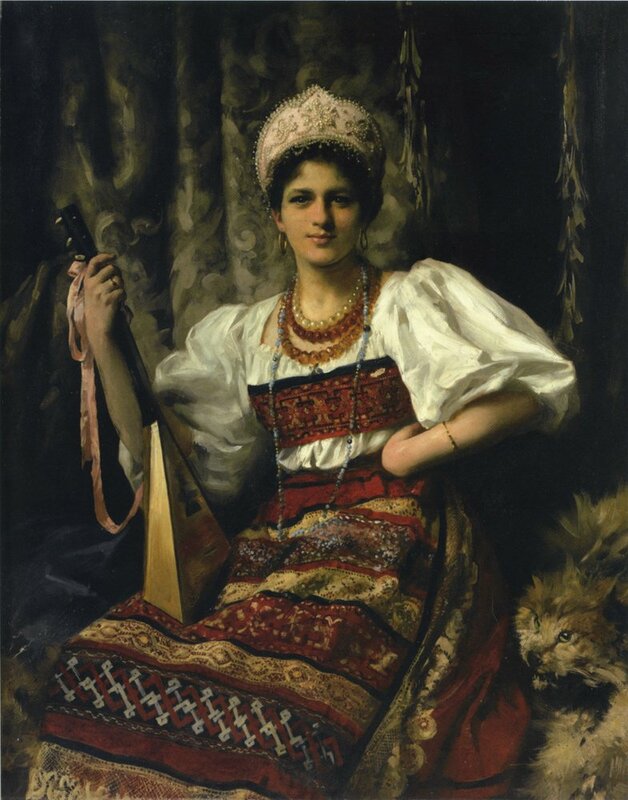 The other, when she was older, was of her, dressed as a Russian lady holding a balalaika. 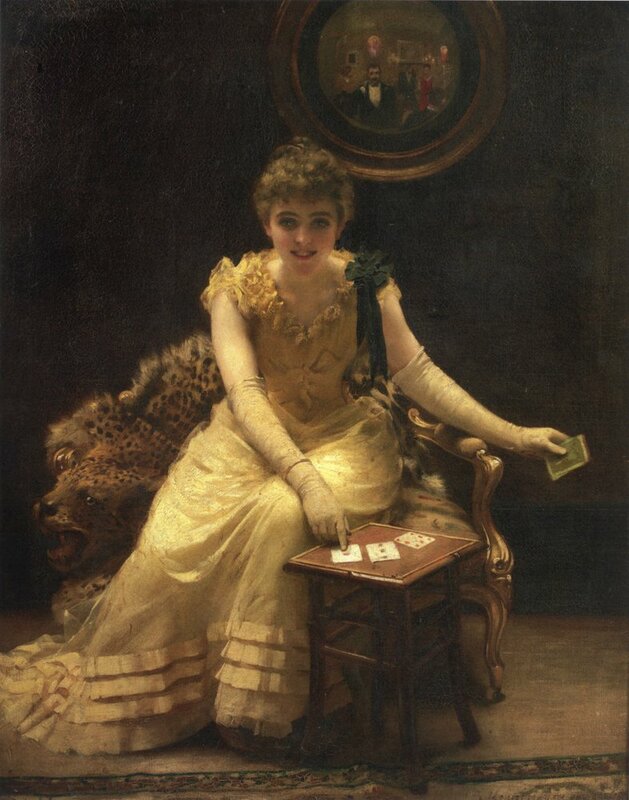 My last offering is another interesting work by Kennington which he completed in 1882 and entitled The Ace of Hearts. There is an element of trickery about this depiction. We see the lady seated before us staring directly at us But are we who she is looking at? Look carefully at the mirror on the wall, above and behind her. The image in the mirror indicated that the lady is looking straight through us, and focusing upon a man who can be seen scratching his neck. He seems perplexed by what the woman is doing with the cards. Look at the expression on the lady’s face. It is one of satisfied triumph as she points to the ace of hearts and we can thus deduce that she was performing a card trick for the gentleman. He is amazed and she is exultant with her trickery. Thomas Benjamin Kennington died in London in December 1916 aged 60. His wife Elise died at the young age of 34 in 1895. Their son Eric was to go on to be a famous artist and in my next blog I will look at some of his work.